Don't run out of time with the square unisex digital LED watch! This bold watch features a silicone strap with a buckle closure and a square face that illuminates a bright red LED light. 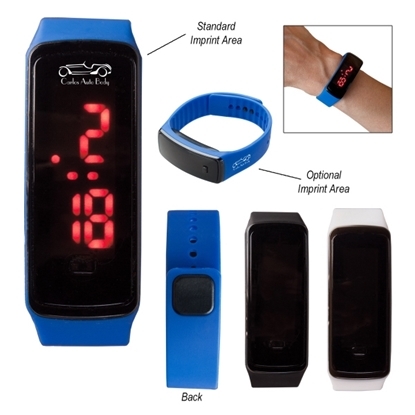 Simply touch the button to change between the multiple functions and hand out this unisex watch at tradeshows, conventions, fundraisers, and more. Don't forget to imprint your logo or company name on this wrist wear and show off your brand no matter where you go! Make telling time a trendy adventure with this rectangle unisex digital LED watch! It features a bright red light to illuminate the face that will keep you up with the times. 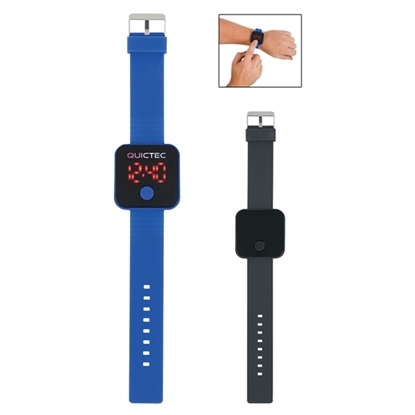 Use the double snap closure to wrap the silicone strap around your wrist and use the touch button to change the multiple functions: hour, minute, second, month and day. Add your logo using our pad print imprinting method and remind recipients of your brand with every look! Mypromotionalpens.com offers the largest and best priced selection in Promotional Digital Wrist Watches. We will price compete and we won't be under sold. Let our graphic designers make your personalized Digital Wrist Watches standout above the crowd at no charge. We won't stop until you are completely satisfied with your custom Digital Wrist Watches art proof.Use category search filters on your left to help narrow your search to find exactly what you are looking for.